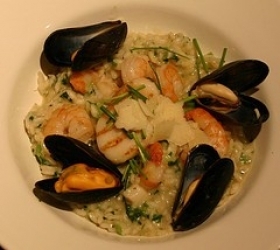 Have you made Main Course Seafood Risotto? 1. Set clam juice and broth in a saucepan and have it at a bare simmer before you begin. 2. Heat olive oil in a wide saucepan and cook the onions for 5 minutes or until lightly golden. 3. 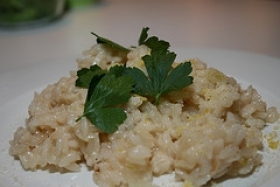 Add the rice and stir, continuously for a couple of minutes to lightly toast it. 4. Add the wine and cook gently until almost entirely evaporated. 5. 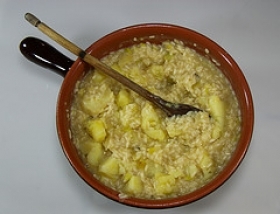 Add 1/2 cup of the boiling water and stock and simmer the rice, stirring constantly, until all the liquid is absorbed. 6. 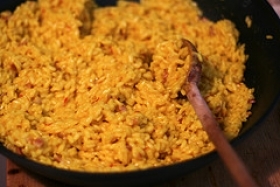 Add 1/2 cup more of simmering liquid and stir the rice until it has again absorbed the liquid. 7. Continue in this fashion, adding a cup of liquid after 1 1/2 cups are in. 8. When rice is half way done (after about 15 minutes) cook the seafood. 9. In another skillet heat the remaining 2 tablespoons olive oil and saute the shrimp and scallops for a minute or until almost entirely cooked. 10. Transfer the seafood to the rice and continue to finish cooking the rice until entirely tender (should take about 30 to 35 minutes in all). 11. 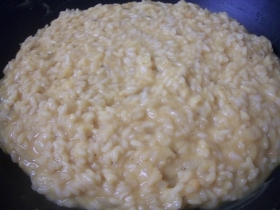 When done, the rice is just tender, has absorbed the liquid (you may not need it all). 12. Add the butter, season to taste with salt and pepper and dish out. 13. 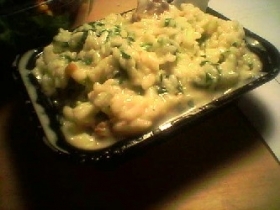 Serve immediately or the rice will continue to cook and turn to mush. 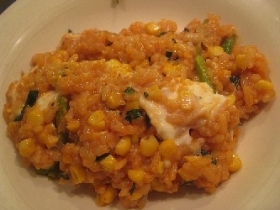 This recipe is high in Vitamin A with 20% of your daily recommended intake per serving. This recipe is high in Vitamin C with 29% of your daily recommended intake per serving. 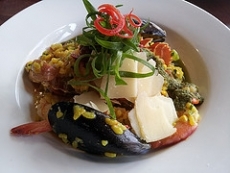 This recipe contains potential food allergens and will effect people with Wheat, Fish, Shellfish, Butter, Gluten, Tomato, Rice, Sulfites, Shrimp, Iodine, Scallops, Onion, Olive Oil allergies.